A: A coverage based scenario (see map above), as shown in the 2030 CLRP which is nearly identical to today’s network with the 2030 headways. A1: A service shrinkage scenario that limits Metro’s operations to the principal service in A. The non-principal service in today’s network is presumably returned to local operators. 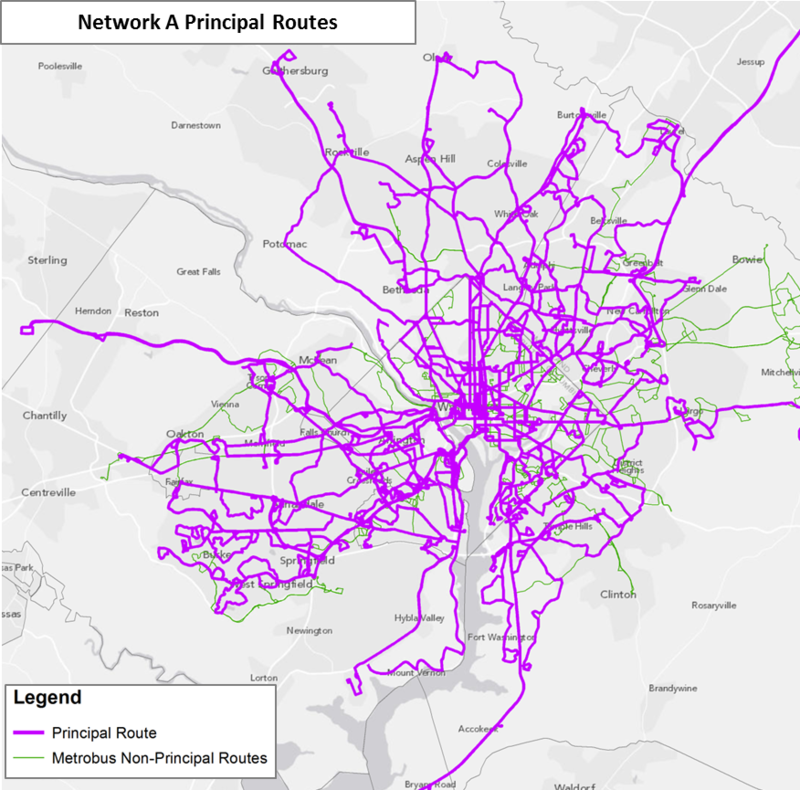 To become the principal service, a Metrobus corridor must meet three core criteria – connection of regional activity centers, high ridership and more direct service on the arterials. This led to the selection of 200 principal corridors that are truly regional. Principal routes include all of Metro’s Priority Corridor Network plus other major regionally significant corridors. These routes are also not defined or constrained by the fiscally “regional” or “non-regional” formulas that determine how Metrobus is funded. B1: A service shrinkage scenario that takes A1’s network and adds frequent services along regional corridors. 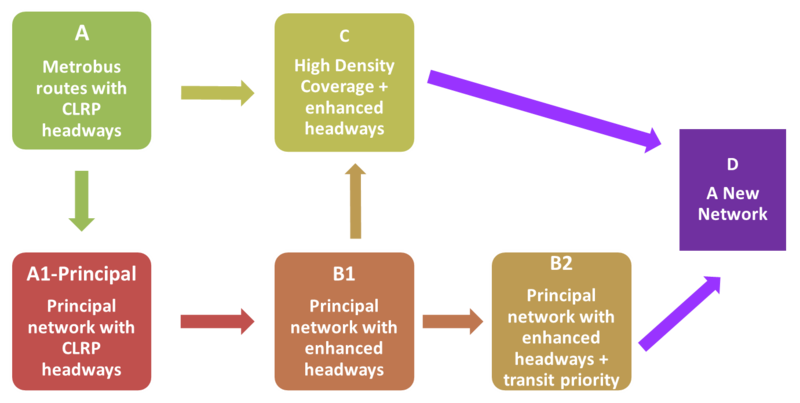 B2: A stepped-up B1 network that decreases passenger and bus travel time and invests in transit priorities, such as queue jumps and signal priorities. C1: A service expansion scenario that further expands Metrobus Network A, with frequency increases and service expansion into the outer suburbs to ensure transit accessibility across the region. 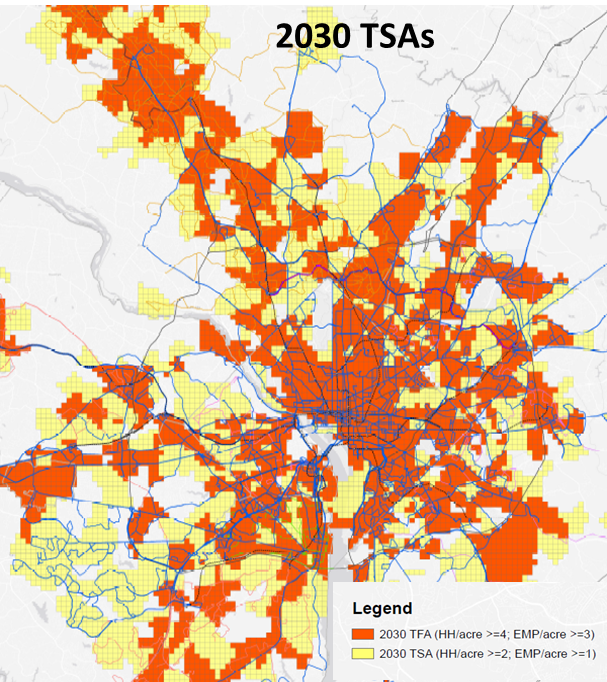 Transit Supportive Areas (TSAs) define the locations where transit is likely to perform the best in the future. A redesigned network that is unencumbered by today’s network structure, provides a web of regional services, and takes the best of the above networks. To help assess the performance of each alternative network, Metro planners and jurisdictional stakeholders developed a set of goals, objectives, and corresponding measures of effectiveness (MOEs). A future post will discuss the assessment of individual networks and the MOEs that effectively differentiate the networks. What do you like about each network? How would you redesign the Metrobus network and its role? I would try to straighten out the bus routes. The top two maps, like the current Metrobus system, look like a ball of yarn that a kitten has been playing with. When my employer was in Shirlington, I used to ride the 23A between Shirlington and the VRE station. The bus made about 12 turns in 3 miles. At times it was headed away from its destination. At Shirlington I also would see buses destined for the Pentagon going in opposite directions. It was confusing, and I’m a long-time transit user. Now the company is in Skyline, and there are bus stops all over the place, with no clear place to connect between lines. I usually ride the 28A, which shares stops with a few other routes, but there are many more bus routes touching Skyline, and who knows where they all go? If the streetcar is built to Skyline, I hope there will be a common terminal for streetcars and buses. OK, I’m rambling more than the 23A. Let’s have more bus routes that go more or less straight from one place to another. I am so so so so so so glad you are looking at headways (as you might imagine). But what *are* the 2030 headways being proposed here? I’d like to see how frequent you imagine the future network being, particularly on some of the crosstown lines and also as related to dedicated transit lanes. I love the strong coverage from everywhere to downtown, but where are the circumferential routes? I realize that there is not as much demand to go between MD and VA as there is to downtown DC, but surely a limited-stop service running to places along the beltway would do some good. 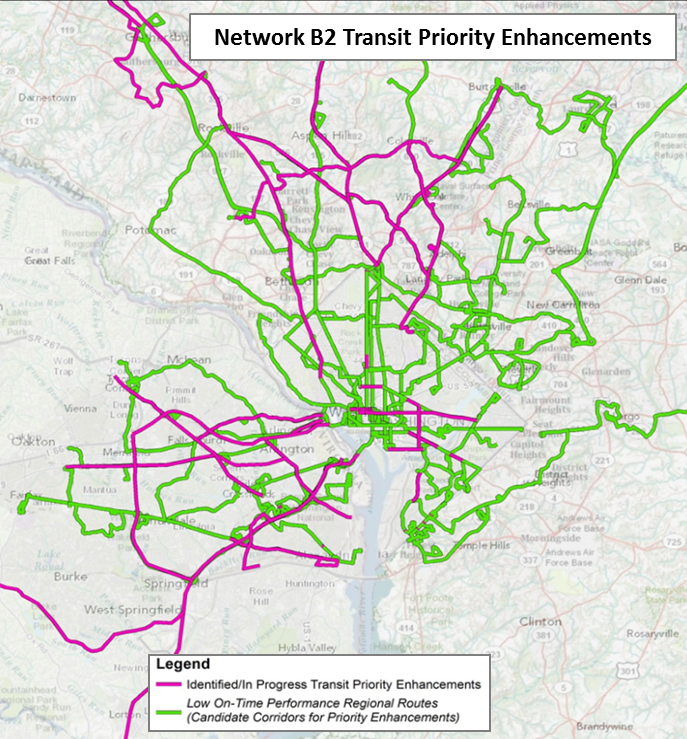 It would be easier to implement in the interim and could cover more area and connect some major employment centers and Metro Lines – Alexandria, Tysons, Bethesda, Silver Spring, College Park, Landover (and FedEx Field for events), Andrews, National Harbor, and back to Alexandria. I happen to work in a mostly residential area, but surely a great deal of the Beltway drivers are going to similar places and would appreciate a real alternative. I think you have to look not just at density, but also poverty rates, when determining required levels of service. The fact is that a poor neighborhood of 100 people will have more people who are dependent on the bus than a neighborhood of 100 wealthy people. Lots of people say, “by providing better service to the wealthy neighborhood, we’re getting one more car off the streets, which is not as true in the poor neighborhoods where they don’t even have cars to begin with.” But the purpose of improving mass transit is not just to get more cars off the streets, it’s also to make people’s lives better. So I do think that — not just from a social justice perspective, but also from a greater-good-for-greater-number-of-people perspective — poor neighborhoods should get a leg up when it comes to transportation planning. Also you have to remember that, while rich people basically only use public transit to get to their jobs in the core (where there’s already Metrorail), poor people use public transit for everything, to go everywhere, including doctors’ offices and county social services buildings, which are not served by Metrorail. When a rich person has to go to the Fairfax County building out by Fair Oaks, he’s driving, period, no matter how many buses are available in his neighborhood. When a poor person has to go there, he’s taking three buses and transferring two times and spending the whole day on the trip. If you’re looking to improve service and attract more riders, you should strongly consider implementing a systemwide proof-of payment system. This will eliminate a large source of delays on many routes, greatly improving service and attracting more riders. San Francisco did it, and it is standard across much of Europe, but DC persists in making people pay one-by-one to get on the bus, wasting everyone’s time. Also, straighter routes, lower headways, and a route naming system that is obvious. Oh, and bustime information that reflects actual wait times. The system now is abysmal, often 10+ minutes off the mark. How bout just increasing the distance between stops from 1/8th mile to 1/4. @Simon – if you were responding to my post (I think you were?) I agree with your entire point, but I was not suggesting this be a trade-off. I would think that running empty buses almost anywhere is pointless, but considering the high numbers of peak hour commuters who take limited-stop/express buses from places like Olney, Leesburg, Centreville, etc., clearly people with money and cars will take transit when a viable, speedy, and comfortable option is available to them. I realize this implies inherent inequality because, well, it is. Someone with options must be swayed to take transit, while someone without options will accept their lone option. This can be handled by running frequent service to in-need, low-income areas, while providing “enhanced” options to “choice” riders (WiFi, cushy seats, etc. – similar to commuter rail) but only with high frequencies at peak times. That said, it’s a bit ignorant to think that all of the people who work at the places that I mentioned are rich and would not chose a convenient and speedy bus option. Many people who work in these places are in entry/mid-level positions and are living on a budget and are paying off student loans. Others might just hate driving (especially in traffic) and would gladly chose the option that allows them to get to work without driving on the Beltway or other congested suburban roads for miles. There’s nothing connecting NOVA and MD. Yet traffic between the two is always terrible between 270 and Tyson’s. Why not connect Grovesnor and Tyson’s? Connecting Virginia and Maryland employment centers is a glaring omission in the current Metro bus system. I have lived in Bethesda and worked in Tysons, and lived in Reston and worked in Bethesda. These types of interstate commutes are a big factor in the traffic tie-ups on the beltway. Traveling all the way into Metro Center is not really a practical alternative to just driving. I think the system has to be redesigned from the ground up, with a few things in mind. First, not everybody works from 9:00 to 5:00 weekdays; more off-peak, evening, night and weekend service is needed in many places. Second, commuting patterns have changed a lot; not everybody in Alexandria, for example, is trying to get to the Pentagon, and (as someone has already alluded to) many Alexandrians work at National Harbor and have a nightmarishly long transit commute, when it’s possible to do it at all. Third, let the local providers in VA/MD handle the neighborhoods and short hauls, use Metrobus for the longer regional trips (like how the 28A and 29K/N were changed in the past couple years). To Xmal: Metrobus actually HAD service across the Woodrow Wilson Bridge for over 20 years (first the P-13 route from Eastover to Pentagon — and later on, it operated another route from Branch Ave station to King Street station, at 20-minute intervals). Ridership was very minimal – only a handful of passengers. 93% of the operating cost had to be subsidized, with fares paying for only 7%, so the route was discontinued. Good idea. Directness is one of the key factors in designing a new network. Factors in determining future demand include projected population and employment, land use density, travel demand to and from each analysis zones, and “transit propensity” (low vehicle ownership or low income) within a ¼ mile zone around each corridor. In designing new network routing, the study team wanted to look at all anticipated trips though out the region in 2030. One of our focuses has been on connecting regional activity centers (COG currently identifies 120 such centers in the Washington region). This includes many trips between regional activity centers outside of the core. Details will be available in the next two blogs on the comparison of alternative networks and the design of a new network. Metro has approved guidelines for the design and placement of bus stops (the document is available on our website). These guidelines recommend an average stop spacing of 4 to 5 stops per mile for local bus service. This new spacing is being implemented all new routes and on two to three existing routes per year. Thanks for the history on past VA-MD buses. Maybe the end of the green line isn’t dense enough?What about Anacostia to Alexandria? Many of the holes do have decent service provided by Ride On, The Bus, ART, Fairfax Connector, etc. There needs to be more _9 routes (I think they’re branded “MetroExtra” now?). Limited stops along the busiest routes, regardless of the current operator. These should be expanded to reflect their heaviest usage of the corridor, whether that’s commute time, evenings, middays, or weekends (7th st corridor (79) has quite a bit of midday and weekend usage, e.g., as does H st (X9) in the evening). But the biggest silver bullet would come from off-board fare collection and all-door boarding. Do it just for the _9 routes, but allow offboard collection for all buses that stop at the same stops. On a crowded bus, you’re mainly stopped just to let people line up to pay (and of course, wait for people to exit the front door, since for some reason DC folks can’t understand to leave via the back door). All-door boarding quickens that immensely. I’ve never been on a Circulator bus that has 3 doorways like some of the articulated buses in San Francisco and Los Angeles. Do you mean the fact that one of the 2 doorways has 2 doors rather than 1, and therefore wider? If that’s the case, its nice, but will do very little without off-board fare collection. If the wide doorway is up front, everyone still has to queue to pay when getting on (and the culture here appears to be that everyone waits for exiters to leave before paying). If the wide doorway is in back, the fact that DC bus riders don’t consistently leave out the back door means any benefit will be limited. Combine the wider doorway with off-board fare collection and all-door boarding, and you’d increase the benefit of the latter two, though. WENDY LAST WEEK I WAS HOME ON VACATION I LISTEN TO YOUTUBE HOW NEW YORK CITY TRANSIT GOT ALL RETRO BUSES BACK ON THE ROUTE WASHINGTON D.C. METROBUS NEED TO FOLLOW UP LIKE NEW YORK CITY TRANSIT DID.BRING ALL RETRO BUSES BACK FROM THE 40’S 50’S 60’S AND 70’S BACK TO WASHINGTON D.C. BACK ON THE ROUTES IN DC MD AND VA.